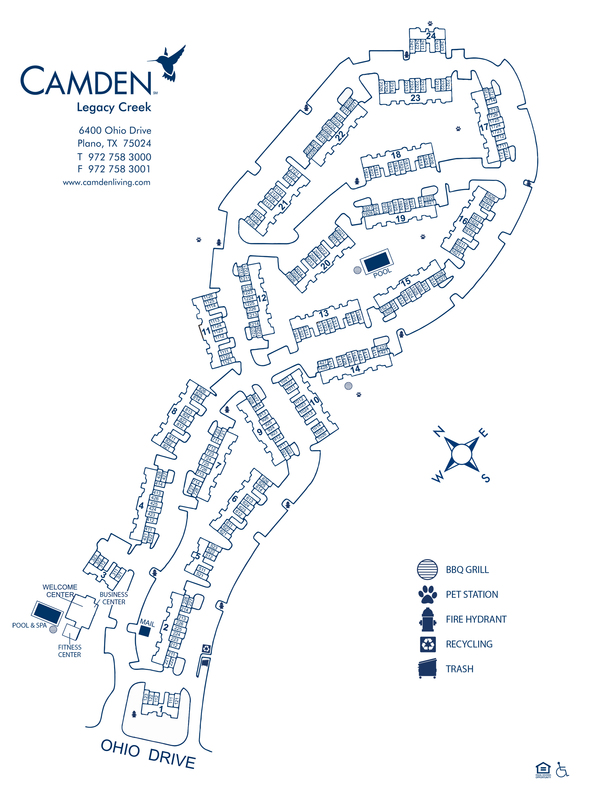 Camden Legacy Creek defines luxury apartment living in Plano, TX. Our one and two bedroom apartment homes feature attached garages, hardwood-style flooring, crown molding, high-speed internet and WiFi, cable TV and a washer and dryer included in every home. Our apartments also feature stainless steel appliances, granite-style countertops with decorative tile backsplash and peaceful park and creek views. Camden Legacy Creek offers two swimming pools and an outdoor resident lounge with a fireplace and two grills. Our 24-hour fitness center has a variety of cardio equipment, free weights and more for a total body work out. You can even walk outside your front door and onto Plano's popular Bluebonnet Trail, a 7-mile biking and jogging trail. The clubhouse has different areas for whatever mood you are in - home to complimentary Wi-Fi, a large flat-screen TV, a demo kitchen and more. Don't just take our word for it, check out this virtual tour of our clubhouse here. Camden Legacy Creek is located in the desirable Plano Independent School District. Your apartment is conveniently located 10 minutes or less from President George Bush Turnpike and Dallas North Tollway. Take advantage of the great shopping and dining at The Shops at Willow Bend, Stonebriar Centre and The Shops at Legacy all within 10 minutes of your apartment home. Stop searching - your home is here at Camden Legacy Creek. Each apartment home includes a private attached garage. In addition, we have ample open parking for our residents and guests available on a first-come, first-served basis.